Recently, I was invited by a friend to join her and a group of others to "go to Ba Ren to eat really, really hot, spicy szechuan food." Mike was jealous, since he'd heard interesting things about the place - sorry Mike, you only get to see the pictures along with everyone else. The place was a little intimidating initially, since not much English is spoken. I arrived at Ba Ren a couple minutes early and asked about our reservation. I was met with a bit of a blank stare and "reservation??" - which prompted me to dash back outside and await the rest of the group. Once strength in numbers arrived we were hustled to a large table in a side area, as far away from the main dining area as possible. So apparently you can make reservations - just don't expect them to be happy about it. 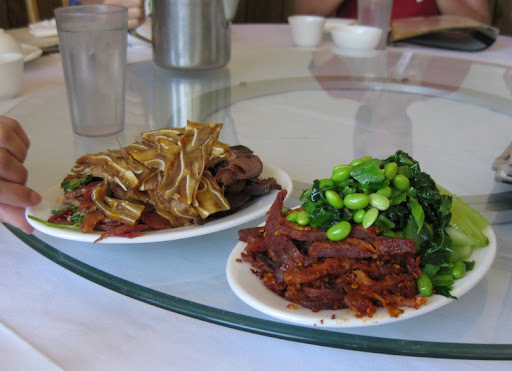 The plate on the left holds thin-sliced jellied Pig's Ear on top of sliced Pork Tongue in the back, and another tasty meat of some kind in the front. The other plate holds marinated cucumber spears in the back, a salad of edamame and greens on top, and a really spicy chile-crusted meat of some sort. I'm told that one of the two unidentified meats was a tripe dish called Husband and Wife (at least that's what my friend thought it was), but we're not sure which. I liked the tongue a lot, and was pleasantly surprised by the intriguing crunch of the pig's ear. We've tried using pig ears at home, with much less success (one of the few instances where Fergus Henderson, our guide in these matters, has let us down). Everything at Ba Ren is served family style which means the bigger group you dine with, the more dishes you get to taste. Along with our two plates of appetizers, we opted for six main dishes and a vegetable for our group of ten. 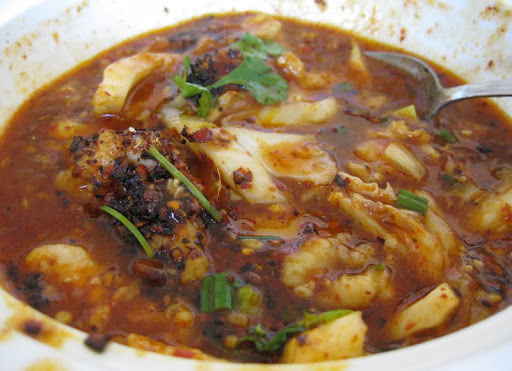 The fish was in a dark red sauce with a lot of cabbage and tons of spicy, mouth-numbing whole szechuan peppercorns. Overall it was tasty and not too hot if you avoided some of the peppercorns. 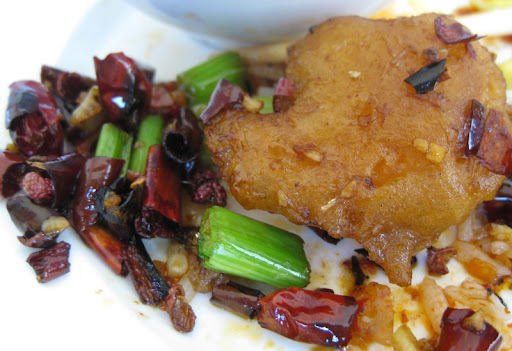 This was deep fried chicken pieces served among piles of cut-up dried chile peppers along with the obligatory szechuan peppercorns. It looked like it was going to be very fiery, but I was told that the dried chiles aren't meant to be eaten - they just flavor the cooking oil. I found this dish to be ok, but fairly one-dimensional. Ba Ren's menu isn't always easy to decipher when reading the English translations - "Cut Beans" anyone? 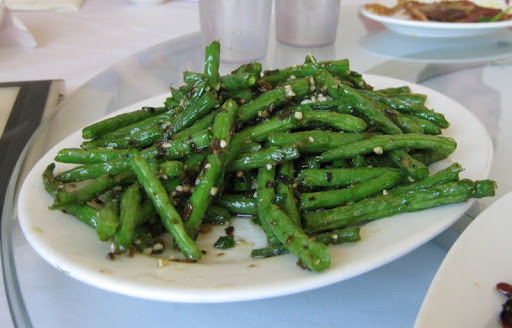 It turns out that this was a very savory dish of stir-fried green beans seasoned with plenty of garlic and ginger and only a pinch of szechuan pepper. The spicy, tender lamb was quite nice, especially paired with the crunchy fresh bean sprouts scattered throughout. 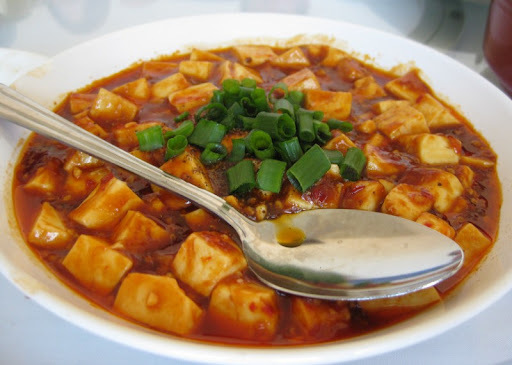 Simply-prepared with an earthy, slightly pungent red sauce and generous cubes of soft tofu, this was really good over steamed rice. Spicy, but not over-the-top. I think I had thirds of this one. 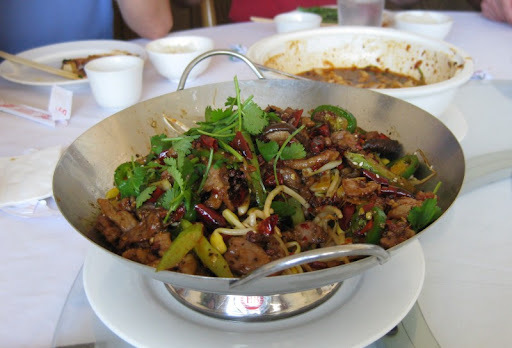 The braised duck was one of the few dishes without a lot of heat from either chiles or Szechuan pepper. It was rich and flavorful, although a bit challenging to eat since the small chunks were bone-in. 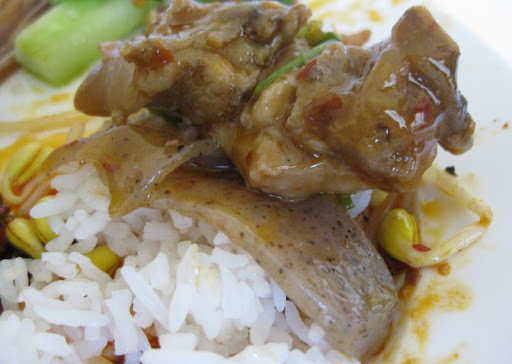 While nobody was enamored of the jelly-like taro, the duck was a winner. As you can tell from most of the photos, my fellow diners were quite patient with me and generally allowed me to get a shot of each dish before everyone started to dig-in. Patient until we started nearing the end, that is, when everyone was enthusiastically and cheerfully eating without much pause. Thus, the meager photo of a morsel of duck on my plate above, and a lone shrimp below. 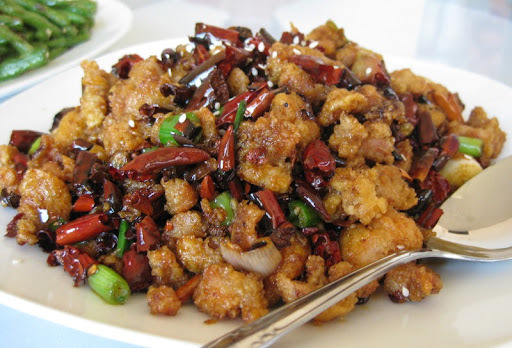 These two-bite crispy fried shrimp had both sweet and salty components in the batter and were infused with the tongue-tingling flavor of Szechuan peppercorns. The shrimp were quite addictive - if there had been anything other than a huge plate of chiles remaining on the shrimp platter I would have helped myself to another! My friend had visited Ba Ren several times before, and on previous visits she had been served a complementary rice pudding-like dessert. After finishing our meal, one of the members of our group who spoke Mandarin asked about the dessert. The waitress responded (in Mandarin) that she hadn't planned to serve it, as many customers do not want it, but yes, she would bring it out. 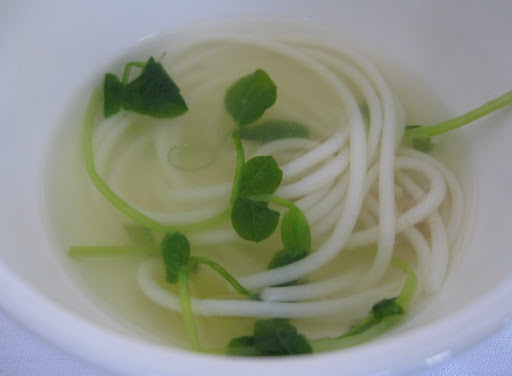 Chicken Noodle Soup with Pea Sprouts and Sour Pickled Greens (aka Dessert Soup). This was a really nice, comforting way to restore my spice-abused taste buds. I especially liked the vibrancy of the pickled greens. Later I learned that a clear, mild soup and pickles are traditional endings to a multi-course Szechuan meal. Who knew? While the restaurant still intimidates me quite a bit, I definitely want to return. I recently started following your blog, and love it. I don't even really remember how I found it. I went to Ba Ren several months ago and was a bit disappointed. I thought it was a bit over-hyped. The huge chunks of vegetables like peppers and green onions seemed a bit haphazard, and to top it off; We experienced some negative preferential treatment vs. native Chinese speakers. But, looking at the assortment of dishes you tried, makes me envision a better experience, as well a new desire to return. Welcome Gabe, Glad you're enjoying our blog. I should mention that of our group of ten, four were native Chinese speakers and the service was still a bit awkward. Mostly it just made it easier to understand the menu ("cut beans"?) and communicate any requests (dessert please!). I normally don't like dining with large groups, however in this case I think it was key - we got to order a large variety and there was always something new being placed on the table. Much more fun. Great write up. 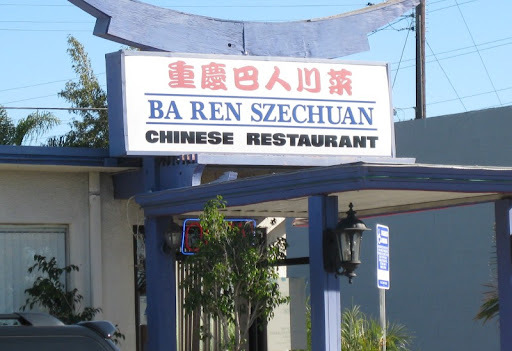 Ba Ren is one of my favorites for spicy szechuan. Typically I order the dry cooked lamb and the deep fired chicken with peppers. 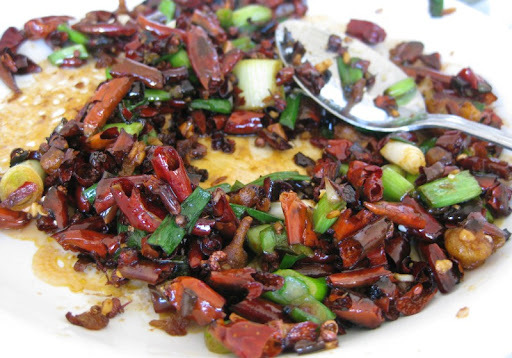 The szechuan peppercorns really make the food take on a really unique taste. Unlike most restaurants more people the better since you can have so much variety. Their dry cooked items are great, and I also rec. the double cooked fish or double cooked pork next time. Their menu is pretty long. Hi Sherry - Ba Ren has since returned to serving the eight treasure rice pudding, which is a really nice end to a spicy meal. Been going there for six years now....and have never had a problem. Chef has over 30 years experience, and is originally from Chongqing, and was head chef at Traffic Hotel, which if I recall was a 4-star hotel. Hi Sawyer, Thanks for the "double cooked" fish or pork suggestions. I agree, the menu is lengthy, so recommendations for my next visit are greatly appreciated! Hi Kirk, I think we got soup to finish the meal because they had run out of the rice pudding, but it was surprisingly nice. Actually, all of our dishes were well-prepared and tasty. Very authentic Szechuan food! Very Delicious and hot! I just ate more rice and drank more soda to calm myself down.